Background: Access to urethras and ureters of infants may be hazardous and injurious through an endoscopic route. Placement and removal of stents in infants requires anaesthesia and access through these small caliber urethras. We describe our technique of placing antegrade splint during a laparoscopic pyeloplasty in these infants. 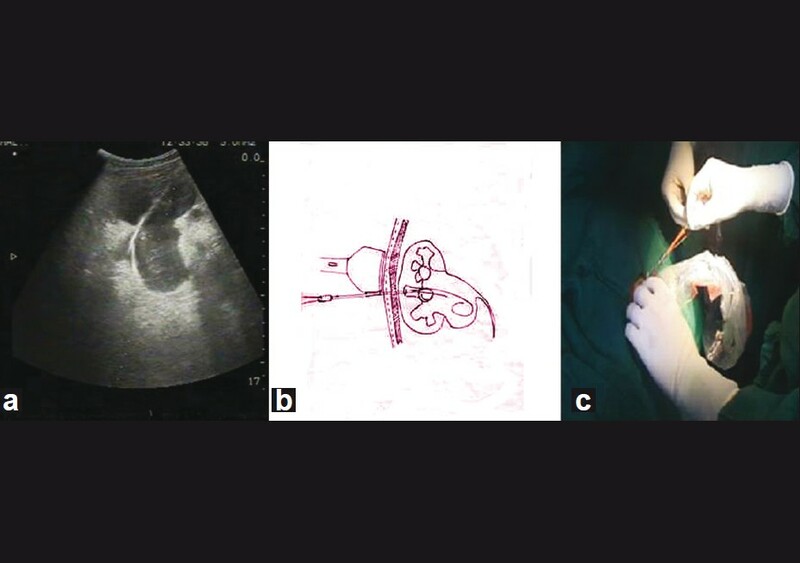 Materials and Methods: An ultrasound-guided percutaneous renal access is obtained. Telescopic metal two part needle is passed into the kidney over a guide wire. A second guide wire is passed through the telescopic metal two part needle. The tract is dilated with 14 Fr screw dilator. Over one guide wire, a 5 Fr ureteric catheter is passed and coiled in the renal pelvis. Over the other wire, a 14 Fr malecot catheter is placed as nephrostomy. Laparoscopic pyeloplasty is then done. During pyelotomy, the ureteric catheter is pulled and advanced through the ureter before the pyeloplasty is completed. The ureteric catheter thus acts as a splint across the anastomosis. Ureteric catheter is removed on the 3 rd post operative day and nephrostomy is clamped. Nephrostomy is removed on 4 th post operative day if child is asymptomatic. The modified technique was successfully done in five patients aged less than one year old. All patients tolerated the procedure well. Post operative period was uneventful in all. Conclusion: Ultrasound-guided ante grade nephroureteral ureteral splint for infant laparoscopic pyeloplasty is safe. It avoids the need for urethral instrumentation for insertion and removal of stents in these small patients. "To stent or not to stent" is a point debated since long time. This assumes importance in children and infants requiring intervention for ureteropelvic junction obstruction (UPJO). Although literature supports "stentless" pyeloplasty, in laparoscopic pyeloplasty particularly, it is a common practice to stent the anastomosis. The advantages and disadvantages of both the approaches are well known. In infants, the urethra is narrow and runs the risk of injury and subsequent strictures with surgical manipulations. In addition, the stent-related morbidities which include dysuria and infections may make the postoperative course of the infant unpleasant. In the days of open surgery, it was our policy to employ the technique of open insertion of stent along with a nephrostomy, just prior completion of the anastomosis. This served the purpose of nephrostomy acting as a safety valve prior to removal of splint. In this article, we describe the technique of ante grade access of the ureter, thus potentially avoiding the urethral manipulations and the associated complications. 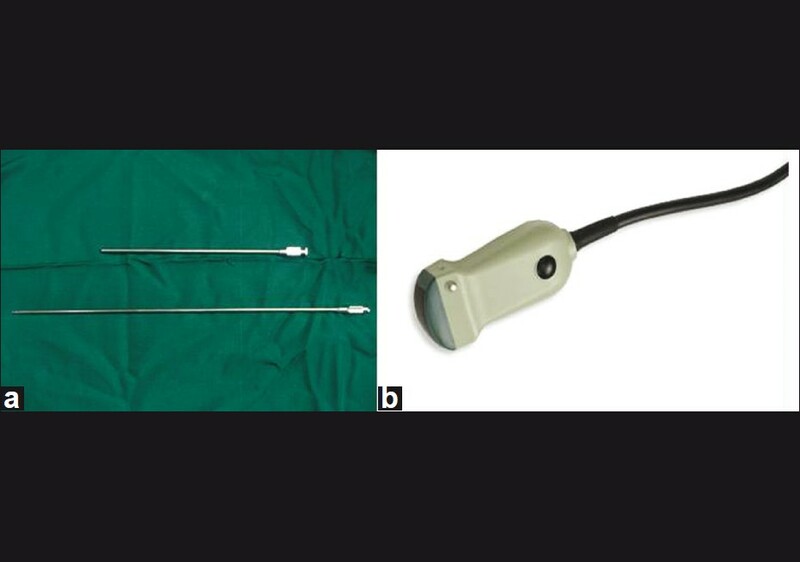 A 7.5MHz (B-K Medical, Denmark) ultrasound probe with puncture attachment is used. A pediatric probe is used for this purpose [Figure 1]. A 18 Gauge Echotip disposable two part trocar needle (Cook Urological Inc, Indiana, USA) which is available as a two part needle was used. A 0.035 Guide wire or alternatively a terumo glide wire (Terumo corporation, Tokyo, Japan)with Alken two part metallic needle helps simultaneously passing two guide/glide wires [Figure 1]. The dilatation is done with Angiotech one step dilator (PBN medicals, Denmark), a14 Fr Nephrostomy tube (Devon Innovations (P) Ltd, Parwanoo, HP, India) with a 5 Fr open end ureteric catheter (Devon Innovations (P) Ltd, Bangalore, India) is used. The first step involves positioning the patient in a prone position, although the same can be done in supine position. [Figure 2] This helps in gaining percutaneous renal access. 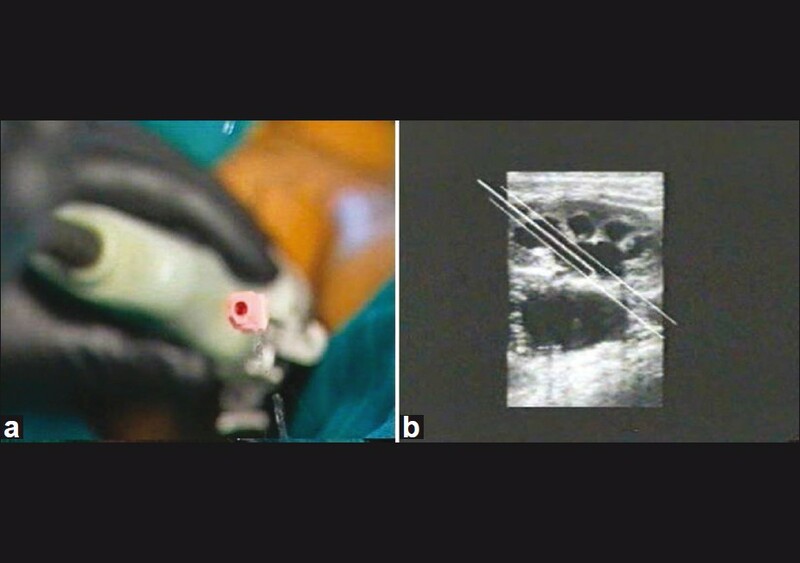 The needle is housed in the needle attachment of the ultrasound probe and the posterior calyx identified [Figure 2]. The "key" for a successful ultrasound puncture is that the needle should be seen throughout the trajectory which includes the skin, subcutaneous tissue, cup of the calyx and the calyx in concern [Figure 3]. An egress of clear fluid suggests entry in the pelvicalyceal system which can further be confirmed with a contrast study [Figure 3]. Next a guide wire is parked in a distant calyx and the tract dilated up to 14 Fr using a screw dilator. An Alken needle, which is a two part needle, helps in passing a second guide wire after removing the inner stylet [Figure 4]. Once both guide wires are in place, one wire is used for passing a ureteric catheter and the second one is used for placing a nephrostomy tube [Figure 5]. The ureteric catheter is coiled in the pelvis. The salient feature of our technique is that all steps of percutaneous access which include access and dilation are done solely using ultrasound guidance. After the ureteric catheter and percutaneous nephrostomy is in place, the laparoscopic pyeloplasty is performed. 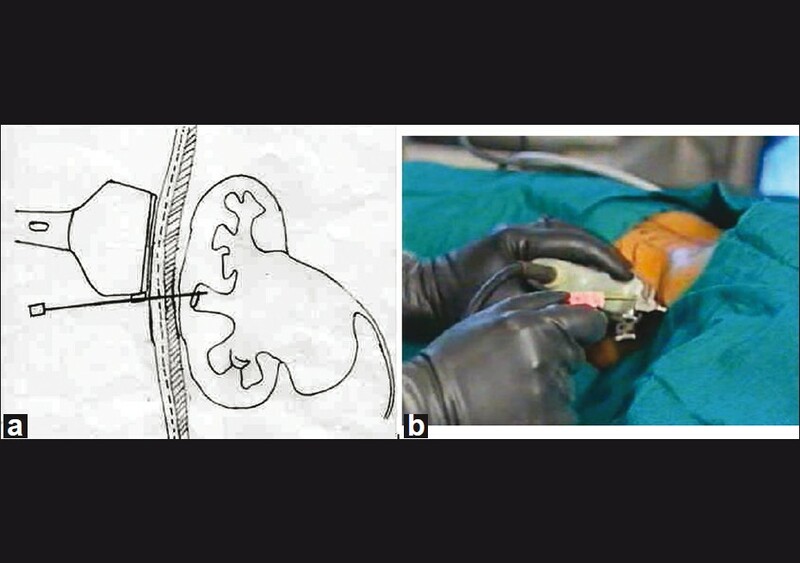 Once the pelvis is opened and the ureter spatulated, the ureteric catheter which is already coiled in the pelvis is passed under direct vision into the ureter after the posterior layer is completed following which the anastomosis is completed [Figure 6]. Ureteric catheter is removed on the 3 rd post operative day and nephrostomy is clamped. Nephrostomy is removed on 4 th post operative day if child is asymptomatic. The modified technique was successfully done in five patients aged less than one year old. All patients tolerated the procedure well. Post operative period was uneventful in all cases. The indications for stenting are well known, they include pyeloplasty in the presence of solitary functioning kidney, infection, or a previous failed procedure. The indications for placing a stent after pyeloplasty differ in adults and children. Placing a stent in a retrograde fashion involves urethral manipulation and the attendant complications; in addition, this involves an additional procedure for removal of the stent. This may be particularly challenging in infants as young as oneyear or less. The advantages of stent placement following pyeloplasty include decreased risk of collection or edema, maintaining ureteric alignment Woo et al., in their study on the impact of internal stenting on the surgical outcome of dismembered pyeloplasty in infants under the age of 12 months with the open approach. They observed statistically significant increase in urinary leaks, length of hospital stay and need for repeat pyeloplasty in non stented versus the stented group. A variety of techniques have been described to place a stent or a splint antegrade thus avoiding the need for cystoscopy during insertion or removal. 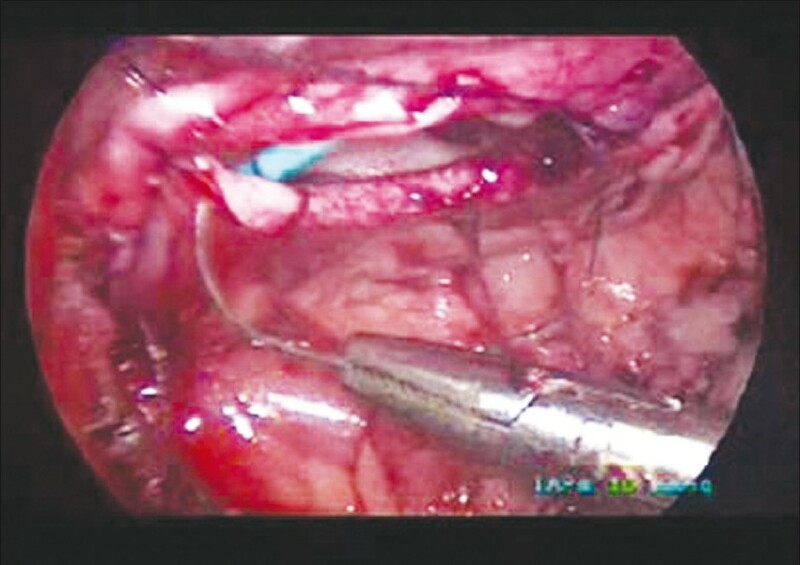 Taveres et al describe a technique for inserting an internal-external nephroureteral antegrade stent during laparoscopic pyeloplasty which can be removed in clinic as outpatient. The debate is ongoing and the literature is divided and inconclusive on this subject. The ureteral access can be gained with ultrasound guidance. This minimizes the risk of bowel injury as well radiation in these patients. The nephrostomy tube acts as a safety valve and can be clamped to confirm the integrity of the anastomosis prior to its removal. If needed, the ureteric catheter can act as conduit to negotiate a ureteral stent across the anastomosis. The same stent can be removed antegrade by attaching a thread to its tail. This avoids urethral manipulations. 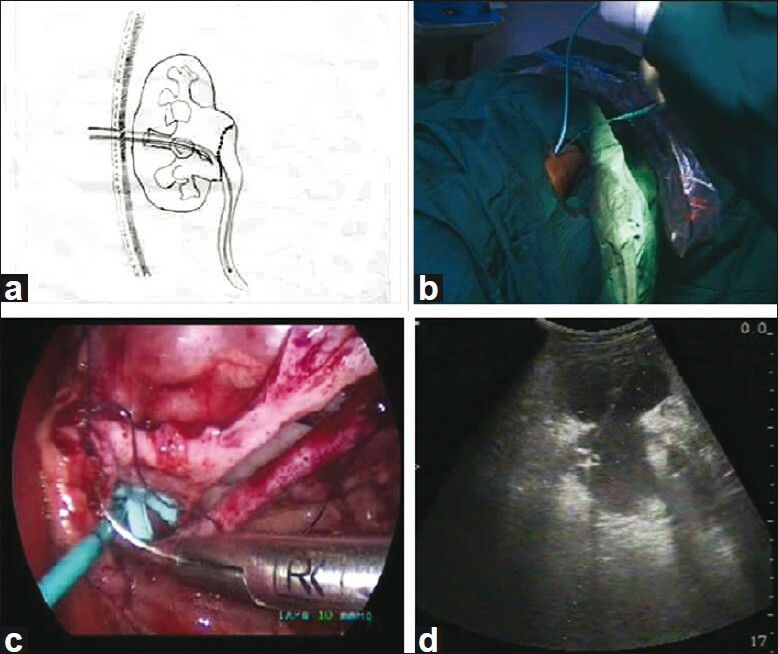 We acknowledge that there are a few disadvantages with this technique and the most significant is the need for additional equipment and expertise for gaining percutaneous renal access. In addition, at times, repeated attempts for gaining access lead to extravasation and oozing, which might hamper the vision and the anastomosis. In infants with pelviureteric junction obstruction when undergoing laparoscopic pyeloplasty; ultrasound-guided antegrade nephroureteric, ureteric catheter placement is a safe technique. It avoids need for urethral manipulation for insertion and removal of stent, decreases radiation exposure to infant. Furthermore, nephrostomy tube acts as a safety valve to confirm the integrity of anastomosis and ureteric catheter may act as conduit to put another ureteric stent if necessary at later date. This technique requires some additional equipments and expertise to get percutaneous renal access which can be mastered with practice. 1. Smith KE, Holmes N, Lieb JI, Mandell J, Baskin LS, Kogan BA. Stented versus non stented pediatric pyeloplasty: A modern series and review of literature. J Urol 2002;168:1127-30. 2. Woo HH, Farnsworth RH. Dismembered pyeloplasty in infants under the age of 12 months. Br J Urol 1996;77:449-51. 3. Taveres A, Manaboriboon N, Lorenzo AJ, Farhat WA. Insertion of an internal-external nephroureteral stent during pediatric laparoscopic pyeloplasty: Description of the stechnique. Urology 2008;71:1199-202.